So what can you do with a sandwich? Well, if you've a sharp knife, some tomatoes, watercress and other tasty ingredients, you can create all sorts of amazing delights. 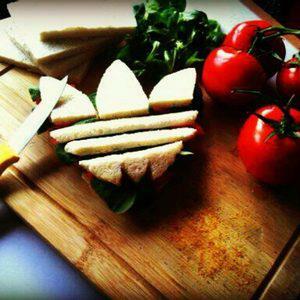 So what sporting theme can you come up with for #lunch? We'll be sharing this on pinterest, so if you're thinking of getting into pinterest or are into it already, hop on over and say "Hi!" Or pop up your image on our facebook wall! I know you're all twitching to get some bread, a sharp knife and join in the fun!